Solving tons of problems will not help you! Solve problems with necessary variability and complexity to enhance your understading and problems solving skills. 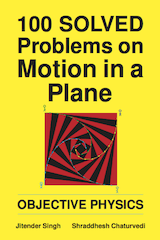 We selected 100 such problems on rectilinear motion (or motion in a straight line) for you! Give brief overview of kinematics in one dimension. The strength of this book is selection of problems. Each problem focus on a particular aspect of theory/concept. The solutions are complete. The book is published by PsiPhiETC . Its average rating on Amazon is 5 out of 5 (from 1 reviews as on 26 January 2019). This book is available in Kindle eBook as well as Paperback format (Print on Demand from Pothi.com).